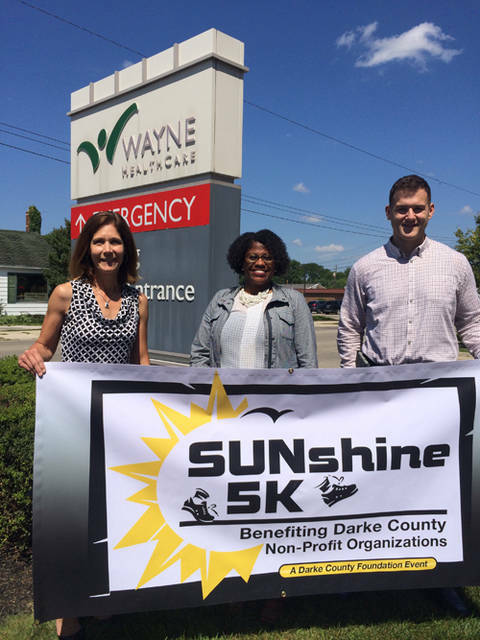 Wayne HealthCare is a major sponsor of the SUNshine 5K on Sept. 15 in Greenville Park. Pictured (left to right) are Christy Prakel, executive director of the Darke County Foundation; Terri Flood, Wayne HealthCare director of marketing and communications; and Jordan Francis; Wayne HealthCare wellness director. GREENVILLE – Discounted registration ends Thursday for the annual SUNshine 5K Run/Walk, which will begin at 8:30 a.m. Sept. 15 in Greenville City Park. Wayne HealthCare is serving as a major sponsor of the event, which is hosted by the Darke County Foundation. Participants may register at www.darkecountyfoundation.org. The entry fee until Thursday is $18 for ages 15 and older and $15 for ages 14 and younger (includes long-sleeve tech T-shirt). After Thursday, the entry fee is $25 (limited shirts available) or $5 for ages 14 and younger (no shirt). A free kids 800-meter fun run is at 8:15 a.m., and free childcare is available during the 5K. The SUNshine 5K is part of the Darke County Wellness Challenge. For more information, call 548-4673 or e-mail dcf@darkecountyfoundation.org.